In October 1818, Lieutenant Colonel McRea ordered an engineer named Poussin to make surveys of the fortifications in Norfolk harbor (BC #814, McRea to Poussin, October 15, 1818). Poussin’s 1819 rendering of Fort Norfolk is the earliest scaled drawing that shows the completed work of Armistead (1808-1809) and Thayer (1814) in both plan and profile. 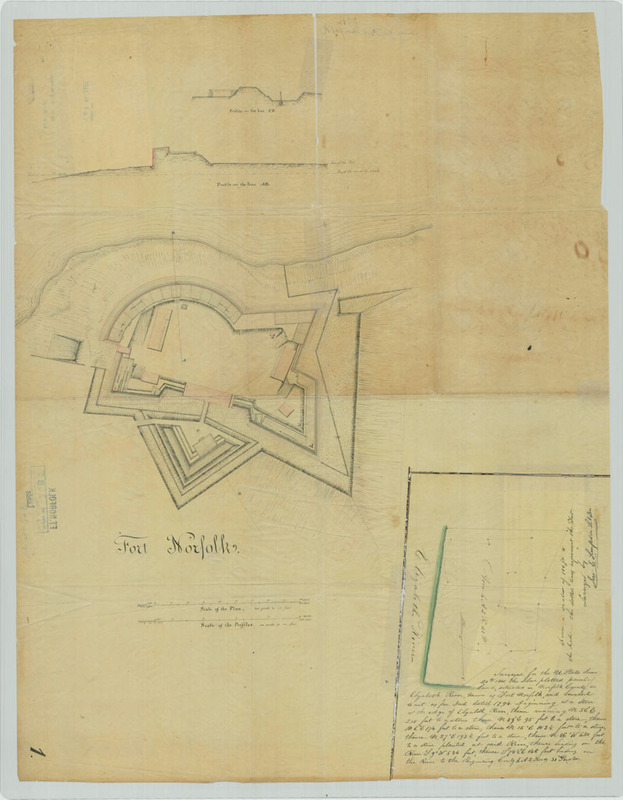 From the documents discussed above, Armistead’s contribution included the curved bastion that faces westward over the river' the smaller rampart at the southeast corner of the fort, and the fort buildings. Thayer constructed the ravelin on the east side of the fort and expanded the northeast bastion. He may also have widened the parapets throughout the fort. The hatched line on Poussin's drawing suggests the limits of the glacis. Neither Thayer’s palisade nor the burial grounds are shown. Poussin seems to have referred to the original 1794 deed rather than the 1816 plat when delineating the fort boundaries (Poussin 1819) (see above). After the War of 1812, Forts Norfolk and Nelson reverted to the Regular Army. From 1817 to 1822, Captain Mann Page Lomax of the 2nd Battalion U.S. Artillery was the commanding officer at Fort Norfolk. During the last seven years that the fort was occupied by the Army, its garrison fluctuated between 40 and 60 artillerymen. In March 1817, for example, Captain Lomax commanded "Company P," which consisted of a first lieutenant, a sergeant major, a sergeant, three corporals, two musicians, and 44 private soldiers present and fit for duty. Four members of the garrison were under arrest and confined to the guardhouse and another man was listed as sick. At various times, a surgeon was assigned to the fort, and as many as three junior officers served under Lomax at one time (RUSMP Reel 868, March 1817; passim).